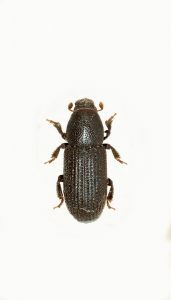 Black turpentine beetles are members of the pine borer family. Larger than related pine borers, the turpentine beetle is active along the entire east coast of the United States where they typically target southern pines, red spruce and other pines. Black turpentine beetles are small, black, oval shaped and good flyers. Once active in the yard, the infected tree will fill the air with turpentine beetle pheromones used to attract more. Female beetles initiate the problem by targeting a good host tree. Once on the bark, she’ll drill a hole attempting to nest under protective bark. Holes created by turpentine beetles will form a “pitch” of tree sap. This defensive behavior can thwart the invasion but often times is not enough to stop all activity. Beetles surviving the gooey sap will move laterally around the tree trunk channeling galleries soon to be used by young beetles. Once inside the tree, the female will attract a male, mate and lay eggs. Turpentine beetle larvae will feed in groups burrowing just underneath the bark of host trees. This feeding will create wide tunnels making the damage quite unique to this species. 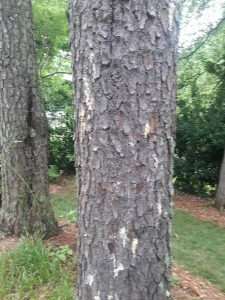 Sawdust will often spill from the tree as they feed, a sure sign of damaging activity. Within a few months of hatching and feeding, beetle larvae will branch off from their family group where they will drill small chambers used to pupate. A few weeks later they’ll emerge as adults and either stay on the host tree or move to one nearby attempting to spread their population. Turpentine beetles can cycle 3-4 times a year depending on your weather zone. The initial damage done to trees infested with turpentine beetles is usually not enough to kill it. Nesting tends to focus on the exposed roots and the first 5-8 feet of trunk. Look for tell tale holes emitting sap. When first discovered, a thorough treatment should stop new beetles from coming around and within a few weeks, kill off the active beetles underneath the bark. If activity is controlled in the first 2-3 years, you can generally expect save the infested tree allowing it to fully recover. Trees showing beetle activity should be sprayed with BIFEN XTS. One thorough treatment can usually kill off current activity but plan on treating every 3 months for the first year to ensure complete control. 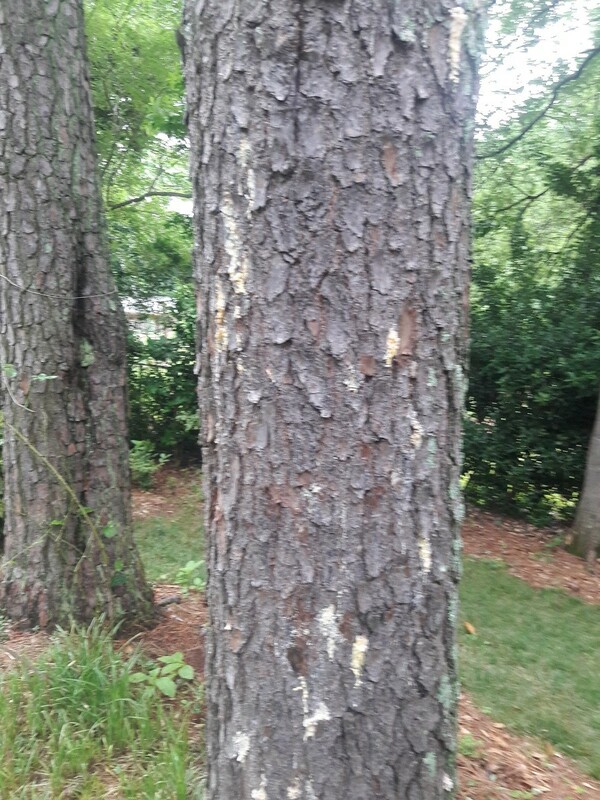 Mix .25 oz of Bifen per gallon of water and plan on using .5 to 1 gallon of mixed spray per infested tree (depending on the size of the trunk). Apply the Bifen using any good PUMP SPRAYER. You can also use a good HOSE END SPRAYER. 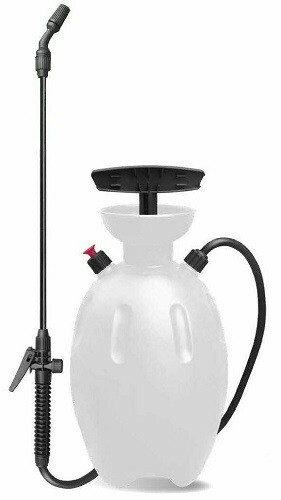 Using our sprayer, you’ll want to add 2.5 oz of Bifen and then fill it with water up to the 5 gallon line. 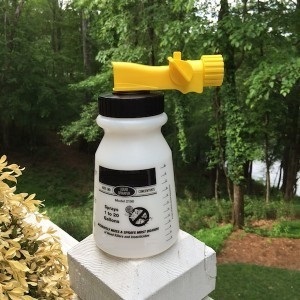 Next, hook it to your garden hose and spray the mixture over infested trees and trees you want to protect from getting infested. Although systemically treating for bark beetles usually won’t kill them directly, it can help any tree under stress. 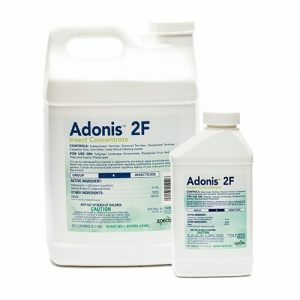 ADONIS is a good product for the job and once it permeates into the foliage of any tree or shrub, insects feeding on the host tree will die. This can have beneficial impact on sickly trees since they can’t stand to loose any vital nutrients damaging pests like aphids, caterpillars, pine moths or whiteflies will cause. Use .1 oz of Adonis per inch of tree width and soil drench inside the drip line of any tree you want to protect. So for a tree 10 inches wide, you’d add 1 oz of Adonis to 3-5 gallons and then “pour” the mixture from a 5 gallon bucket into small holes you make on the ground around the tree trunk. Holes need only be large enough to hold the mixture when poured out and can be made with a pick axe or piece of rebar. Adonis will last a long time and only needs to be applied once a year.